The multi-Tier leaf green stand blends in perfectly with your plants making it a nice focal point in your home. Everyone sees it for first time comments how great it looks. Simple operation:Steel screws fixed connection,Strong and stable,Built-In installation picture,Easy to assemble. 1,The structure of uniform,Clear and beautiful texture, Shiny bright, Durable. 3,High temperature carbonation technology,The surface carbonization color, Anti-Moldy. 5,Color description:As the display imaging principle and production costs are different,Will color aberration. 6,Perfect storage solution:Suitable for any place, Balcony, Living room, Outdoor and so on. Exquisite workmanship:healthy green paint, no formaldehyde, no smell, smooth surface, easy to maintain and wipe;high temperature carbonation technology, after 200 ° high temperature treatment, the surface corbonization color, anti-moldy. 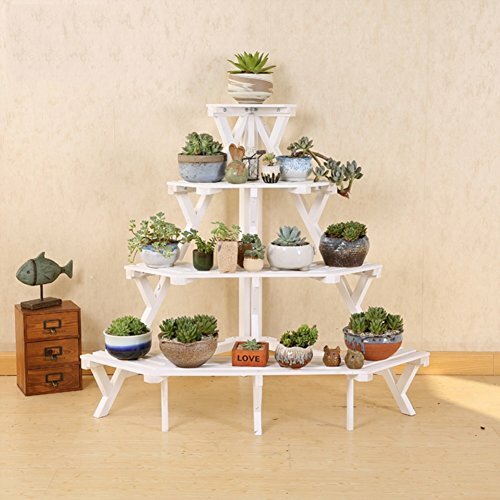 Decorate your wall:these lovely multi-tier flower pot rack provide three-dimensional space,display your favourite plants,present a personalized plant corner,make your visitor admire and praise your ability to decorate. Save space and energy:staircase plant stand allow you to plant more and more flowers with limited space.just a small space,you have a chance to let your home become a green garden and offer your family more fresh air. EASY TO MANAGE YOUR GARDENING:Three-dimensional Place Your Flowers,easy to drain and water,offer you more fresh air. STRONG LOADING BEARING:Solid And Durable Within At Least 50kg Loading,Non-defrmation. If you have any questions about this product by Superflowerstand, contact us by completing and submitting the form below. If you are looking for a specif part number, please include it with your message.